Participants in the ribbon cutting ceremony at Northeast Title & Tag’s new location in Tunkhannock included (from left) Nancy Parlo, Debbie Dowling, Ed Carter, Jr., Kimberly Carter, Dylan Grunza, John Roy Thompson, Rosemary Thompson, Catherine “Kitty” Ohara, Cole Kebles, Maria Carter, Joseph Grasso, Michael Aten, Leslie Cadden, Juliann Miller, Gina Suydam, David Kintner, Christopher Natale, and Adam Ercolani. 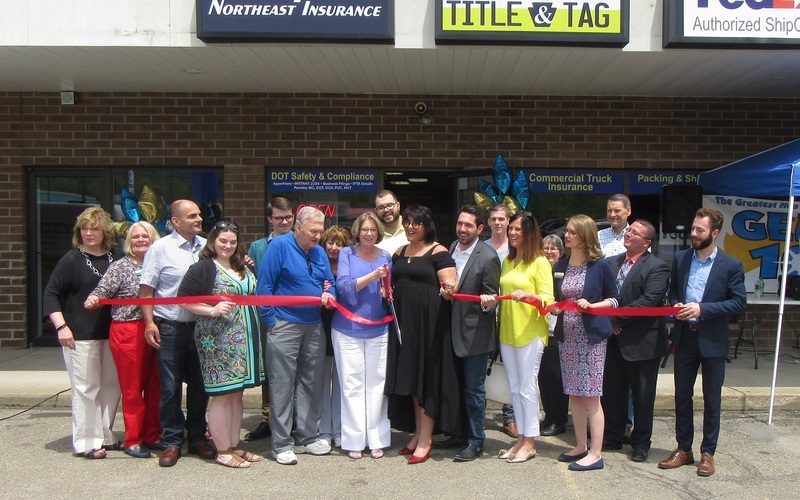 Company founders, family members, friends and long-time customers gathered at the new Tunkhannock location for Northeast Title and Tag at 512 Towne Plaza on Friday. Representatives from the Tunkhannock Business & Professional Association and Wyoming County Chamber of Commerce were also on hand to celebrate the move of the company just a bit west on Business Route 6 but into a much larger space. “There’s more room to do our services bigger and better,” said Business and Public Relations manager Kimberly Carter, the daughter of company president Ed Carter, Jr.. Northeast Title & Tag provides a full line of services for truckers, including IRS Form 2290 filings and DOT updates. In addition to providing commercial and domestic shipping through FedEx, UPS, DHL and Post All, customers can now rent post office boxes at the new store. Northeast Title & Tag also offers vehicle insurances, license plates and online messenger services with the Pennsylvania Department of Transportation, the only agency in the area with that direct connection. Family is the glue on which Northeast Title & Tag together was founded, what holds it together and upon which it continues to grow, Kim maintains. CEO Maria Carter, Ed’s wife, is the daughter of company founder John Roy Thompson. Maria’s son, Joseph Grasso serves as the company’s director of operations. The remainder of the staff, Kim insists, is considered family. Maria gave company vice president Kitty Ohara the honor of cutting the ribbon to mark her upcoming 20th anniversary with Northeast Title & Tag. Participants in the celebration enjoyed a light lunch and had the opportunity to win a number of door prizes. Wyoming County Chamber of Commerce president Gina Suydam noted that the new location is much more visible and accessible. “We’re grateful to see an established business expanding,” she stated. Tunkhannock is the company’s seventh of 11 locations, the first having opened in Clarks Summit in 1970.